Kalavrita. Kalavrita is the name of a city and a municipality in the east - central part of Achaea in the Peloponnese in Greece. It is located in a mountainous area. You can get to Kalavrita by car from the port city of Patras, from the coastal village of Trapeza or by funicular (train) from Diakofto. The road from Patras to Kalavrita goes through vineyards, olive groves and small wooded hills. At some point the landscape starts to change, it is becomes more mountainous. Sycamore and walnut trees are located on both sides of the road. From Diakofto leaves the famous train to Kalavrita. The train runs daily, several times a day. The trip by funicular railway is a magical journey. As soon as the train from the peaceful landscape of Diakoftohas departs, it leads through the deep gorge of the Vouraikos river, which flows down from Helmos. Kalavrita was burned by the Germans in the second World War, but it was rebuilt in the original style. 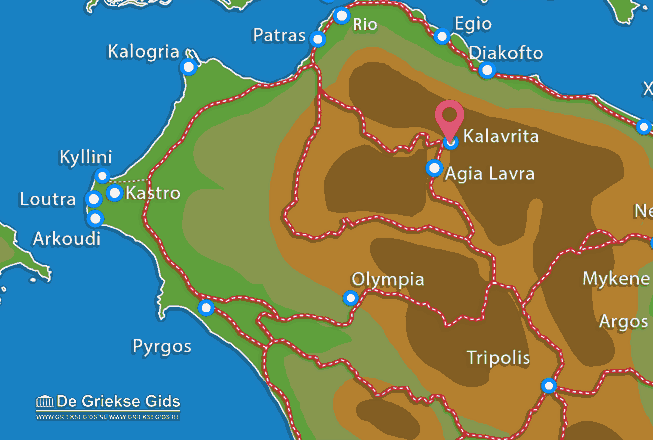 Achaia: Where on the map is Kalavrita located?